The magnificent Ricoh Arena, home of Coventry Football Club, played host to the National Final of the "Coca-Cola" U13 Schools' Cup for Girls. The girls' final was played out between Southern Schools' Champions Winston Churchill and Northern Schools' Champions Archbishop Beck and what it game it was! The early showers of the day faded away and the sun fought through the clouds as the teams took to the pitch to the noisy welcome of their respective supporters. After the pre-match formalities were completed it was down to business and the game was underway. There wasn't much between the two teams as they cancelled each other out in the opening exchanges with few chances being created. The first chance of the game came when a long throw by Becks Olivia Philbin wasn't held by Churchill keeper Amy-Beth Edwards and with pressure applied by Jessica Hindley the ball broke to Lois Poole who snatched at the chance and knocked it wide of target with the goal wide open. Churchill's first chance came a few minutes later when a long through ball fell to Lauren Webb who took a touch then tried to curl her effort in by the far post but unfortunately for the Woking side it fell just wide. The breakthrough goal came after 15mins when a great cross from the left by Alicia Hardacre flashed across goal and Jessica Hindley took a gamble. She slid in at the back post in front of the waiting fullback to knock the ball by the stranded Edwards in goal to put Beck a goal in front. Churchill battled back hard to get on level terms before the break but were not able to get through the solid Beck defence and went in at half time a goal down. But the noisy Churchill fans didn't have long to wait after the break to celebrate their side drawing level. Two minutes into the second period Stacey Kelly's goal kick rebounded into the path of the prolific goalscorer Webb who maintained great composure in rounding the oncoming Kelly before sliding the ball into the empty net from 18 yards out. Beck weren't giving up without a fight and two minutes later they should have regained the lead. Fantastic build up play involving the outstanding Hardacre, Poole and Hunt ended up with Hardacre putting Beth Mawdsley straight through on goal inside the 18 yard box and with the only the keeper to beat she fired her effort straight into the arms of Edwards. The match was beginning to swing from end to end and it was Churchill who were next to go close. A great through ball from substitute Georgia Massa to goalscorer Webb saw the striker knock her effort over the oncoming keeper only to see it run agonisingly wide of target. As we entered the last 15 minutes of the game Beck were starting to show their stamina and controlled the game. Hardacre was orchestrating the game from the middle of the park and she helped create a few openings. 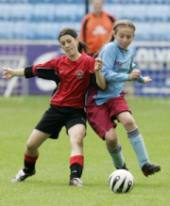 Mawdsley again was in the thick of things as Hardacre played her a great cut back but her effort lacked power. Three minutes later and the same combination worked again but this time Mawdsley had the power but the accuracy was missing. It seemed a matter of time before the goal came. With time running out and the game looking as if it was destined to go to extra time there was one last chance for Beck. Good build up down the left so the ball break to Mawdsley 16 yards from goal but she couldn't direct it past the impressive Edwards. The players had given there all in the 60 minutes of football and there were more than a few tired legs on the pitch but it was an additional 14minutes to see if we could find a winner. The first period of extra time saw both teams cancel each other out, as the game was played long due to the tired legs and very few chances created. The best chance came when an outstanding burst of energy from Hindley took her by three players before she struck a shot from 25 yards wide of the target. Churchill looked as if they had given it everything to get themselves level and were now running on empty but they did have Webb in their side so anything was possible and with the second period of the extra time only 2 minutes old we witnessed one of the goals of the tournament. Churchill striker Gillian Thomas won the ball in the middle of the pitch before holding it up to allow Webb to break and picked out the perfect ball and Webb did the rest. Taking the ball by two defenders before firing an astonishing effort over Kelly in-off the underside of the bar from a very acute angle was worthy of winning any game never mind a National Cup Final! This strike knocked the stuffing out of the Beck team and Churchill played out the remaining minutes without being seriously threatened and when the referee blew her whistle to signal the end of the game the celebrations began. A delighted Winston Churchill Coach, Richie Emerson, couldn't hide his joy, "This is the proudest moment of my life, a really outstanding achievement for the girls, I'm so proud of them." He went on to add, "I always thought we weren't going to lose the game, even when we were a goal down and what can I say about Lauren Webb, She is an outstanding player; having scored hat tricks in the last two rounds and a brace today she has proved she is a big time player. "She was just released from Chelsea last week even though she has scored over 50 goals this season so she also proves she has the character to bounce back after a knock back like that." The goal hero was just happy to win it for her friends, "When we won our first game back in September we knew we were going to do something special. To win the competition is amazing it hasn't sunk in yet. We are all delighted", said Webb. She added, "We have loved every minute of the competition, it has been great." Unfortunately in every final there has to be a loser and Archbishop Beck coach Sharon Mulhaney was proud of her girls, "To get as far as we have done is an outstanding achievement for our girls, everybody at the school is proud of them, their parents are proud of them all and I am certainly proud to have helped get them here." "The girls were brilliant today, credit to Winston Churchill, they are a great team and played well and congratulations to them, we will go home and be proud of the season we have had. I'd just like to thank the spectators here today for their support as well as everyone at the school who have supported us along the way," added Mulhaney. 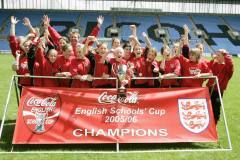 "Congratulations on being the national England schools champions. It's a fantastic achievement and I hope you can go and build on this success in the future."